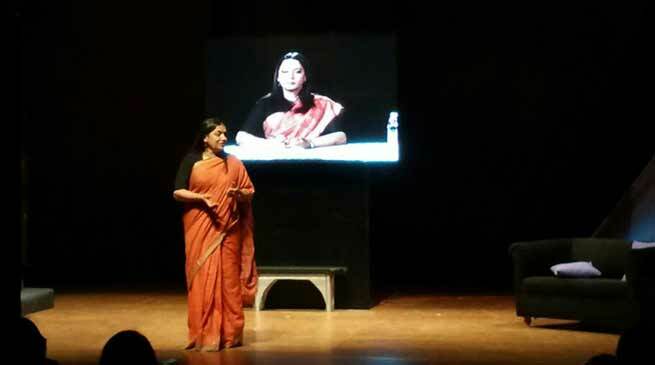 The second day of the GPlus Guwahati Theatre Festival showcased the famous play Broken Images performed by Shabana Azmi. The play is a one-character; one-act monologue exploring the crisis of identity that rips the mask off a celebrity. The first day of the festival featured the play Mother Courage and Her Children, directed by known director Quasar Thakore Padamsee. “The play is written too beautifully. It’s perfect and hence its performance is uniform and loved by all. In this sense, I would say the success of Broken Images is a grace of God. Thanks Guwahati”, said Shabana. The festival will end with its finale play on the 5th of November. Other plays of national prominence like, The Gentlemen’s Club aka Tape, What’s Done is Done and Piya Behrupiya – all from leading theatre production houses of Mumbai will be showcased in the days to come. The plays would feature popular names like Vinay Pathak, Ranvir Shorey, Jim Sarbh, Trupti Khamkar, Sheena Khalid, Mukti Mohan, among others. “We are overwhelmed with the response of the festival with shows running almost packed houses only indicating the appetite of our people for quality entertainment in performing arts”, expressed, Sunit Jain, Managing Director & Publisher of G Plus and the Chairman of Guwahati Theatre Festival. This festival, organised by G Plus, the leading English weekly of Guwahati in association with Apollo Hospitals Guwahati, aim to showcase world-class performances by leading theatre actors from Mumbai coupled with quality entertainment making it a prestigious landmark in the cultural landscape of Guwahati.